Alike a boutique hotel, Villa Sawarin is a five-storey vacation residence that embodies the aesthetic blend of traditional Thai architecture and contemporary tropical luxury. Areas are lavishly appointed and accompanied by first-class amenities – assuring you of absolute comfort and diversion. Atop a hill high above Phang Nga Bay, Villa Sawarin, most certainly, accords you classy vacation living amidst Phuket’s cool, highland air. The villa’s nine air-conditioned bedrooms are on either the first or second lower floors. One master bedroom and six guest rooms are on the first lower floor. Two of these guest rooms are in a detached bedroom pavilion on this same lower floor. Two more master bedrooms are on the second lower floor. All bedrooms are connected to lavish bathrooms, as well as open out to fully appointed balconies or terraces with breathtaking bay views. 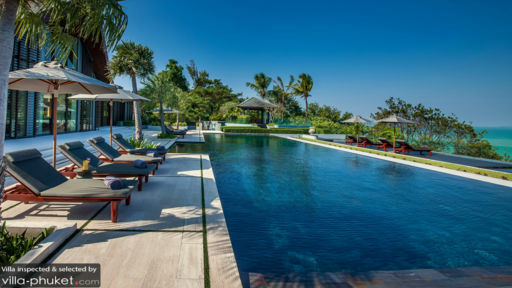 Aligned to the edge of the property’s main floor exterior is the 23-meter infinity pool from where you can gaze out to the bay while taking a dip or bathing in the sun poolside. Adjacent to the swimming area is a fully appointed alfresco sun deck set in the center of a shallow pond where you can catch both the breathtaking sunrise and the sunset. If you’re into sports – particularly golf and / or tennis – you can practice your swing on the villa’s exterior golf greens. Or, serve aces on The Cape Estate’s tennis court. The villa’s main entrance – on the topmost floor – leads to the spacious living area which approximates the lobby of a hotel or resort. Adjacent – at one end of the villa’s common area – is a TV room. The villa has both an indoor dining area – on the other side of the living area – and an alfresco dining area in a sala at one end of the swimming area. 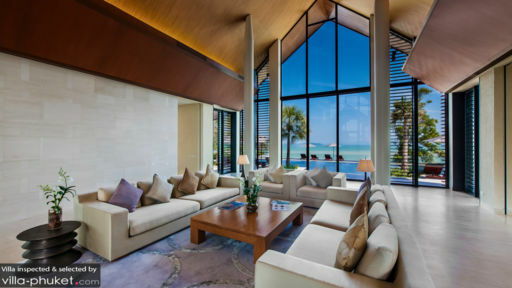 The fully-equipped, ultra-modern kitchen and bar – as well as a Thai kitchen – are all at the other end of the villa’s common area. On the villa’s second lower floor are the gym, the spa room and a family room with both a TV and a ping pong table. On the villa’s middle level is another lounge area, and on beach level is a fully appointed beach house adjacent to the villa’s boat house. The villa’s affable staff will administer services that will address almost anything you ask for. 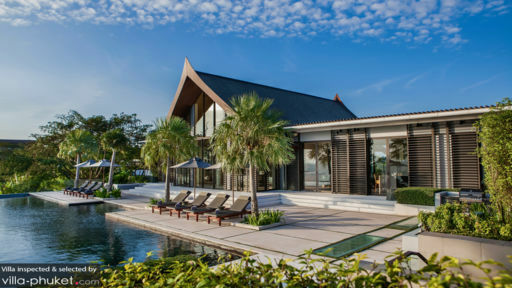 At Cape Yamu, Villa Sawarin allows you to appreciate Phang Nga Bay fully. At the beach on the villa’s lowest level, you can go kayaking and paddle boarding. From the local pier and marina, you can also go on a boat ride around the bay. On another day out, you can go on an inland expedition to waterfalls and nature parks. The shopaholic within will, certainly, also go crazy over Phuket’s largest shopping mall.